Well crap. I was typing really fast and got a squiggly, so I right-clicked on it and rather than selecting the correct word from the autocorrect dictionary, I clicked Add To Dictionary. I added the MISSPELLED WORD to the Dictionary! Now Windows is suggesting that I spell this word (and others) wrong in all apps. At this point I also realized that I had no idea how to REMOVE a word from the Windows Spell Check Dictionary. However, I do know that Windows isn't a black box so there must be a dictionary somewhere. It's gotta be a file or a registry key or something, right? 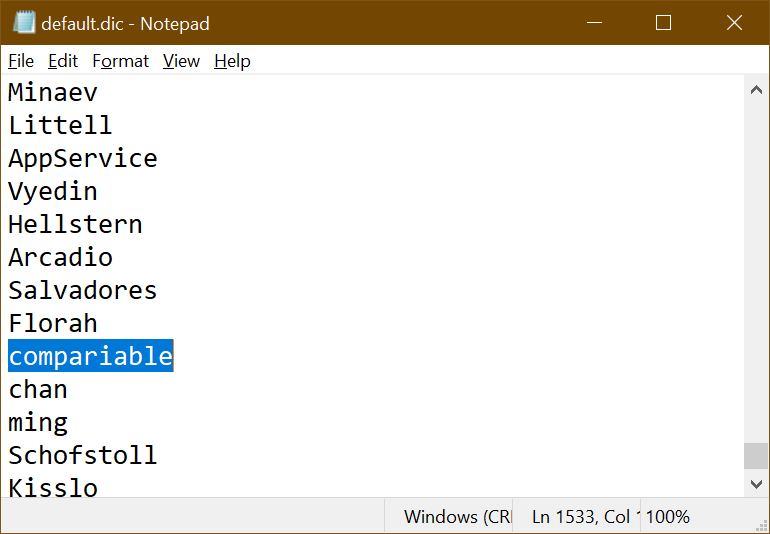 I just opened the default.dic file in Notepad and removed the misspelled word. Whew. I can't tell you how many wrong words have found there way in there over the years. Hope this helps you in some small way. Sponsor: Preview the latest JetBrains Rider with its Assembly Explorer, Git Submodules, SQL language injections, integrated performance profiler and more advanced Unity support. Wow! Great tip Scott! I opened that up and saw I have all sorts of junk in that file. Great to be able to clean that up. just experimented with this by putting in a misspelled word and cannot find it in the default.dic of either UK or US folder! Now I have mizzspelt in the dictionary! Cant thank you enough for this tutorial! There is one thing that needs to be changed. In Option 2, step 5, this needs to be changed to 'save' instead of 'save as'. Correct? Wow, I found too much junk in there and also some languages I didn't know I had ever used. I just deleted all the content from all files.